Earlier this month I reported that Kent Chamberlain of Chamberlain Yachts represented the buyer in the sale of Broward's 32m Freedom with International Yacht Collection; now he tells me that he closed on two more megayachts just last week. On September 22nd he represented an American seller as he closed the deal on Millenium's 2003 built 36m Les Belles asking $4.9 million, with Andrey Shestakov of Atlantic Yacht & Ship acting for a Russian buyer. Les Belles sleeps up to nine guests in a main deck master, VIP and two doubles. 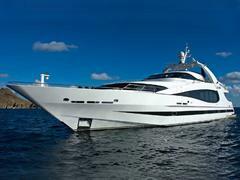 Three days later, on September 25th, Kent acted for an American buyer in the sale of Monte Fino's 32.92m Amore. Built in 1996, she sleeps up to 10 guests in four staterooms and was asking $2.45 million. Johnny Woods of J. Woods Marine Group represented the seller. And there's more, as Kent says he has a 2004-built 42.6m tri-deck motoryacht located in Europe currently under contract. News on that soon, while Kent comments: "Our charter activity is strong and life is good!"